Martin Saber Recurve bow is the best recurve bow that you can lay your hands today. In this Martin Saber Recurve bow review, you are going to see those qualities that stand it out among similar products. It is the most admirable bow measuring about sixty-four inches. Its takedown ability makes it easy to move it from one to another. It is unique in its design and for different things that you can do with it. 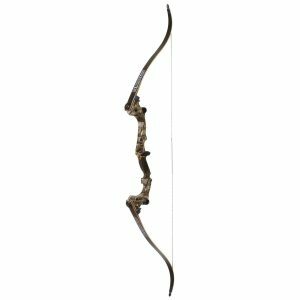 If you are looking for the best recurve bow that you can use this hunting season, you have to opt for this brand. It is accurate, easy to shoot and very consistent. It can always make your day anytime you use it. Who is Martin Saber Recurve bow is designed for? The hunting bow is meant for those who want to perfect their hunting ability. Whether you are an experienced hunter or you are just a beginner, you are going to find this recurve bow helpful. It is good and can meet your hunting expectations. You can use it for hunting competition, expedition and so on. When you order Martin Saber Recurve Bow, you are going to get all the necessary content in a box that will arrive at your home. You can buy at Amazon and other reputable stores online. Here are some of the items included in the box. They include the riser, the limbs, as well as the arrow rest. Also, to be contained in the final package that will reach you is the string, the owner’s manual as well as Martin’s warranty card. These are the items that you are to expect. Arrows may not be part of items to be shipped to you. You can buy it separately. When you get the items, you can set it up on your own. Its owner’s manual would guide you in setting it up. The most important thing users liked about this product is its grip quality. The first thing that you are going to observe about the grip quality is that it offers suitable and larger grip for both larger and smaller palms. This means that you can use it without difficulties. Thirdly, because of the perfect design, its users would hardly develop blisters. It offers the most comfortable grip, and everybody would love this. Another great feature that makes this product unique is the limbs quality. Its laminate is glued properly, and because of this, the outer layer does not peel off easily. Underneath the laminate, you are not going to notice anything like air bubbles. Furthermore, the limbs do not twist even when you have used it for a very long time. It is long and lightweight; when you shoot, you do not experience any hand shock. It can accept the different type of arrow irrespective of whether the arrow is stiff or not stiff, and this is because its shelf was cut past its center. The recurve bow has a very strong string. The string can be durable but would depend on the frequency of waxing. With this product, you can squeeze the string on an average of ten thousand before the string requires replacement and before it begins to break. It is recommended that you always have your backup string available with you so that you can use it when the need for it arises. You can even buy strings from the market and use it on the recurve bow. Secondly, there is very low vibration; this is good because it enhances the arrow flight. Thirdly, this product offers a comfortable grip, and because of this, you can focus on accuracy as it would not discomfort your palm, which could jeopardize accuracy. Furthermore, the bow could hit two groups from 35 yards and you can comfortably do this without using sight. Q. Does this recurve bow accepts accessories? Yes, it accepts accessories. If you like, you can install such other accessories like an arrow quiver, a stabilizer, as well as a 1-pin or multiple pin bow sight and so on. Q. Is this recurve bow great for beginners? Q. Is this bow good for hunting? You can see from this Martin Saber recurve bow review that it is the most popular bow on the market. You can use it for different purposes such as hunting, competition, as well as target shooting. The bow is perfect for all these activities as you can see from its fantastic features. It does not make noise and when it vibrates, it makes the least noise. It is accurate and this means that you are sure of hitting your targets during competition. It is durable and affordable. If you are looking for a perfect recurve bow for your hunting expedition, Martin Saber is the perfect choice for you. It has all the features you want in a recurve bow. My name is Walter Williams, and I’m a bowhunting addict. That’s right, I said addict. After my father gave me my first Samick Sage bow at age 17 my love for this hunting discipline has continued to grow. Outdoorarrow.com is a participant in the Amazon Services LLC Associates Program, an affiliate advertising program designed to provide a means for sites to earn advertising fees by advertising and linking to Amazon.com. *Amazon and the Amazon logo are trademarks of Amazon.com, Inc., or its affiliates.